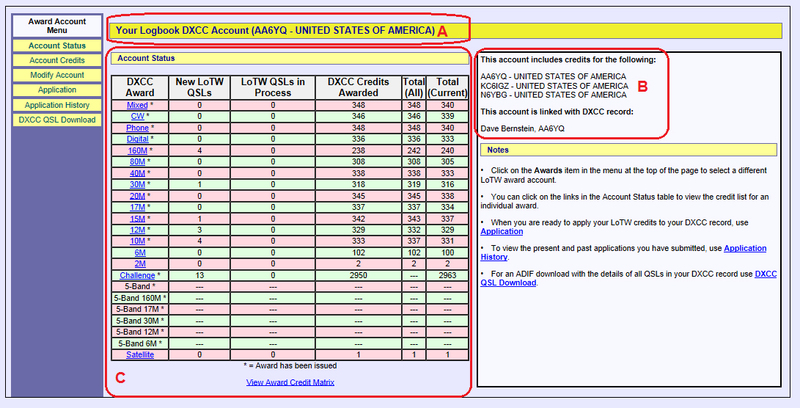 When you view your LoTW DXCC Award Account's status, LoTW indicates whether or not the Account is linked to your DXCC Record, as is shown in highlight B of the first screen shot in the Viewiing an LoTW DXCC Award Account's Status section below. LoTW cannot be used to confirm mixed-mode QSOs. Confirmation of such QSOs must be accomplished with QSL cards. 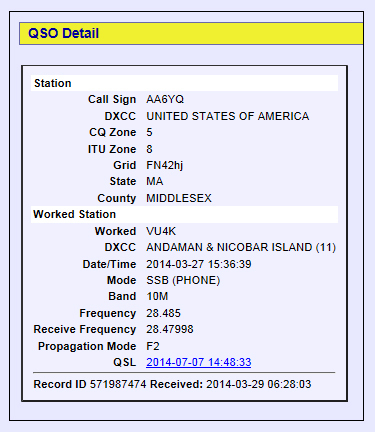 You can view confirmed QSOs with their DXCC Award status. 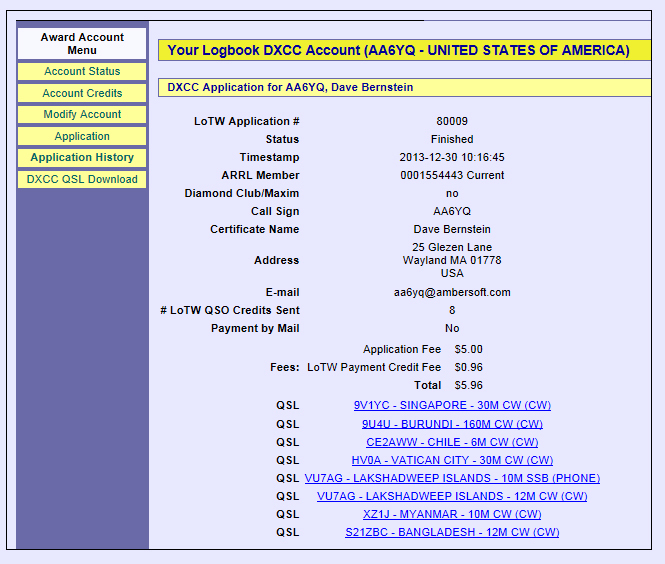 The heading, highlight A in the screen shot above, identifies the DXCC Award Account whose status is being displayed. 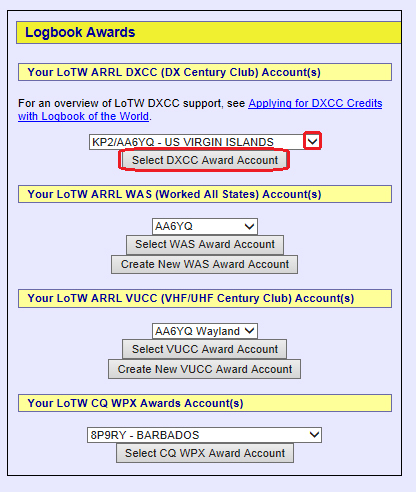 The DXCC Award column specifies the award name, whose hyperlink displays credit for this award. The New LoTW QSLs column shows the number of LoTW confirmations that you could apply for new credit for the row's award. The LoTW QSLs in Process column shows the number of LoTW confirmations that you've included in an application for award credit but have not yet been granted that credit. 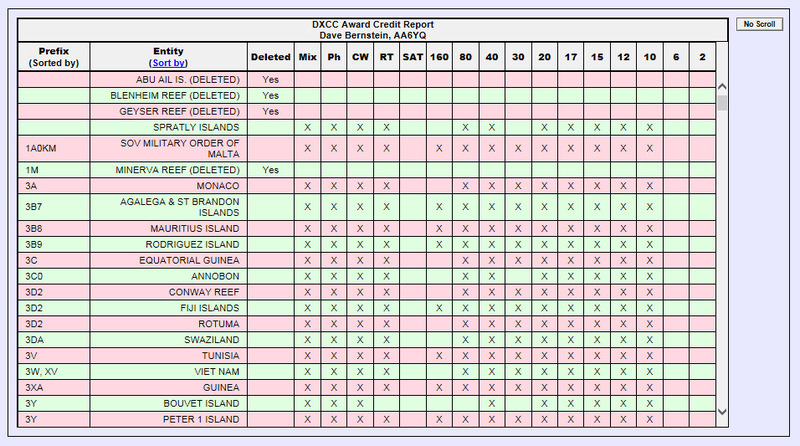 The DXCC Credits Awarded column shows the the award credits already granted for the row's award, including credits for deleted entities. 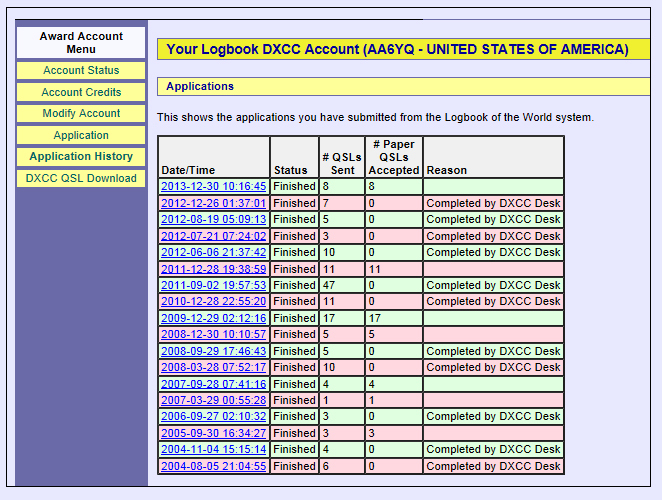 The Total (All) column is the sum of the New LoTW QSLs, LoTW QSLs in Process, and DXCC Credits Awarded columns. The Total (Current) column is the Total (All) column less credits for deleted entities. For printing, clicking the No Scroll button in the upper-right corner of the Award Credit Matrix will display all rows of the table. To download an ADIF file containing a record for each of your DXCC award credits, click the DXCC QSL Download link in the last bullet of the Notes section on the right side of this page. The information returned in this ADIF file is described here. The results are displayed in an Award Credits table. Each callsign in this table represents a QSO. For each DXCC entity to which mixed, band, or mode credit has been granted, LoTW displays the QSO to which such credit was first granted. For example, if your first P5 QSO to which DXCC credit was granted was P5DX on 20m CW, then if you are later granted DXCC credit for a 40m RTTY QSO with P5RY, LoTW will continue to show your P5DX QSO as having been granted mixed credit for P5 because it was your first P5 QSO to which DXCC credit was granted. Note that the order in which QSOs were granted DXCC credit prior to 1991 may not have been accurately recorded. The screen shot below shows Pending credits for the DXCC 10m Award, sorted in entity name order; because they represent pending credits, none of the callsigns are rendered in bold font. The screen shot below shows All credits for the DXCC 10m Award, sorted in entity prefix order (only the first 10 DXCC entities are shown). Note that 1A0KM is not displayed in bold font because it represents a pending credit - a QSO to which DXCC credit has not yet been granted. All of the other callsigns are rendered in bold font because they represent QSOs to which DXCC credit has been granted. 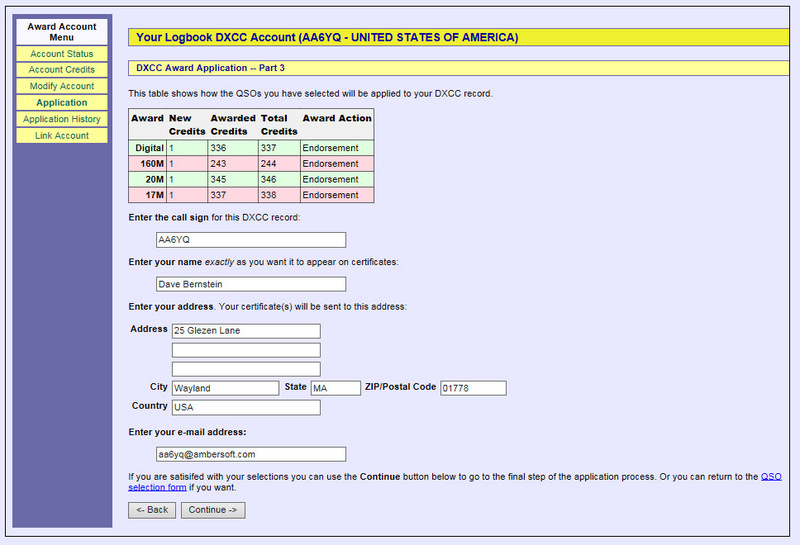 To view QSOs confirmed via LoTW that are currently selected candidates for inclusion in a future DXCC application and (if desired) modify those selections, follow these instructions. The QSO coumn identifies the confirmed QSO's Callsign; each callsign is hyperlinked to a page showing the QSO's details. The third column provides a box that if checked means "include this row's QSO in the application"
Check the boxes of QSOs you want included in your DXCC application - either directly, by using the Check all hyperlink, or by using the Awards column header hyperlinks . Uncheck the boxes of those QSOs you don't want included in your DXCC application. 4. Clicking the Update and save selections button at the bottom of the page will record your selections, allowing you to later return to this step of the application process later with your QSO selections intact. Note that clicking this button with no QSOs selected will display the message "You didn't select any QSOs to submit for credit!" and not make any change to your saved selections. Click the Yes or No button to indicate whether you've already made an application during the current year, and then click the Continue -> button. clicking the Continue -> button. 6. The Part 3 page shown in the screen shot above displays a table that summarizes the QSOs that are included in the application. 7. 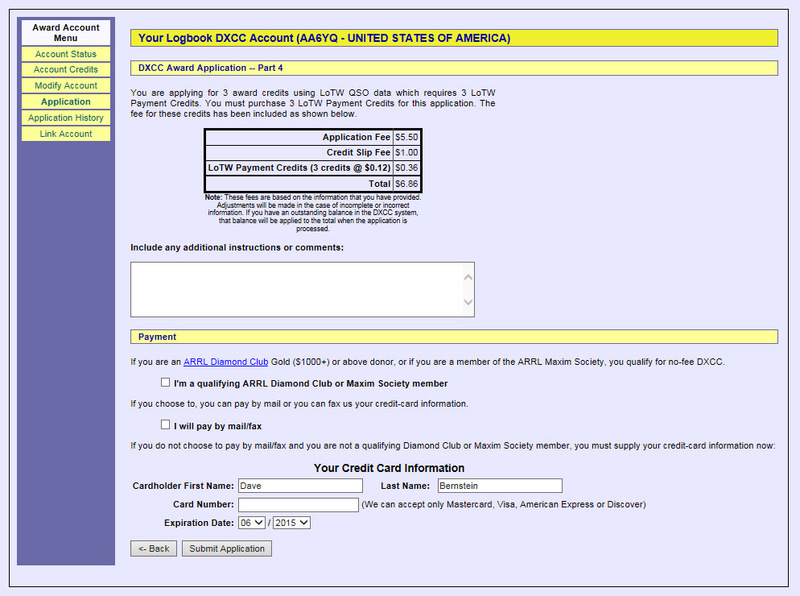 The fee is $6.50 plus $.12 for each QSO submitted for DXCC Award Credit. Specify your payment details, and click the Submit Application button.